I’m all about an easy but big impact and this idea hits the nail on the head. Forgive me but I don’t know where the top photo is from. I got it off of pinterest and can’t figure out it’s initial source. (Anyone know? I will give credit!) What a great way to commemorate a big year. (I also love how they wrapped photos of this man around mini champ and beer bottles. Clever!) 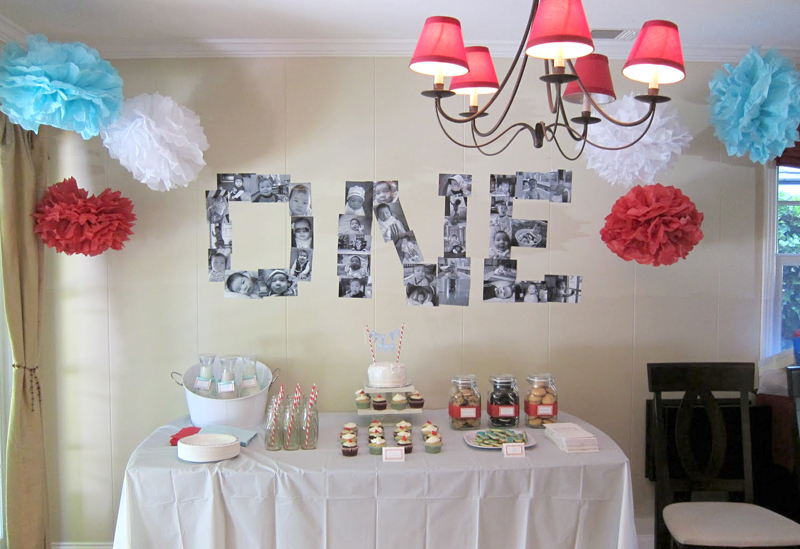 My friend Sandy created this same look for her sweet baby Max’s first birthday. I’m kinda wanting to kick her for not taking more photos since this party looked so cute (Can you tell how adorable that cake looks? I want a close up! ), but I love how bold and sweet the overall look turned out for him. Black and white photos, a little tape, and a number or a word. Easy but awesome! Thieve away! 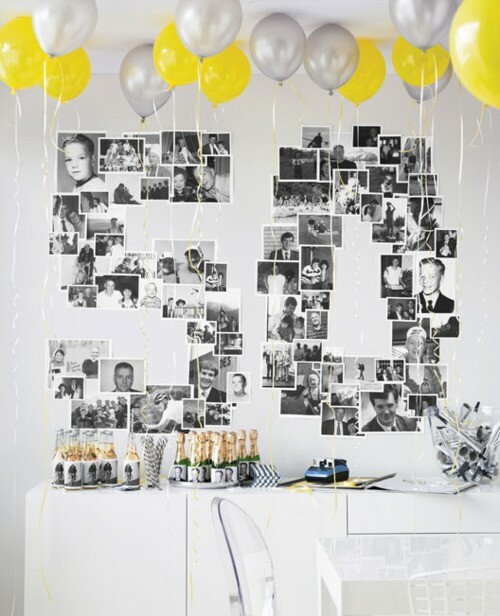 This entry was posted in idea thief and tagged 50th birthday party, black and white photo wall, dessert table, first birthday party, idea thief, milk & cookies bar, red & blue & white party, yellow & black & white party by Annika. Bookmark the permalink. The photo source for “50” is from who else but Martha Stewart. OMG Of course it is!!! Duh! Thanks so much!!! I appreciate it!